An effort has been made to develop the emergency response centre simulator so it is as close as possible to the operations of actual emergency response centres. Operating models based on guidelines by the Emergency Response Centre Administration have been drawn up for the “Kalla” emergency response centre situated inside the simulator. The simulator is equipped with an ELS information system and the TETRAsim communication system. The purpose of the ELS information system is to assist the operator in handling emergency calls, carrying out related risk assessments and forwarding of assignments to different authorities. The simulator’s ELS information system is the same one that is used at actual emergency response centres. The instructors of the Emergency Services College and part time teachers employed from emergency response centres make simulated emergency calls from the game centre to the simulator and communicate as various authority response units. After the emergency call, a learning discussion is held with the student or students who participated in the exercise. 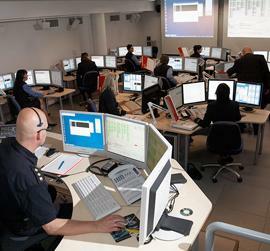 The emergency response centre simulator has 12 emergency operator desks and a teacher’s desk, which can be used during the exercise either as shift manager or emergency operator desks. The emergency operator desk has three terminals for the ELS information system and one for TETRAsim. The information system class and the simulator both have their own database, meaning it is possible to simultaneously teach information system use and simulation. The game centre is a workspace for instructors and part-time teachers from where they can make emergency calls and communicate with the emergency response centre as different authorities. The information system class room is a computer classroom designed for the study of the information system used at emergency response centres. Here students can practice the use of the information system at their own operator desks in practice. Moodle online materials have been built for the instruction of the information system use. A student can use the online materials also to practice the use of the ELS system independently.